The Israelites camped at the plains of Moab which was across from Jericho. King Balak of Moab and his people saw all the Israelites had done to the Amorites and were very afraid of them because the Israelites are numerous. So King Balak sent messenger to tell Balaam to come and curse the Israelites so that he can defeat the Israelites. The messenger departed and arrives at Balaam’s home. They told Balaam about the Israelites and that King Balak had sent for him to come put a curse on the Israelites so that he can defeat them. Balaam woke up the next morning and told them that the Lord does not want him to curse the Israelites. King Balak was not satisfied with Balaam refusing to come and curse the Israelites. So he sent more princes to Balaam this time. The messenger departed to Balaam the second time to ask him to curse the Israelites. So Balaam woke up the next day and saddled a donkey back with the messenger to King Balak. When God saw Balaam departed with the messenger, His anger was aroused. On the way, the angel of the Lord came to stop Balaam. Balaam’s donkey saw the angel with the sword in front of him so it turned to the wrong way to avoid the angel. Balaam thought the donkey was not moving in the right way so he hit the donkey with a stick. Then the angel stood in a narrow path between two vineyards. When the donkey saw the angel blocking the way, it went straight against the wall so that Balaam’s foot touches the wall. Balaam was angry and he hit the donkey with a stick again. The angel went further and stood between two walls. When the donkey saw that it can neither move right or left, it lay down. Balaam became angry and hit the donkey for the third time. 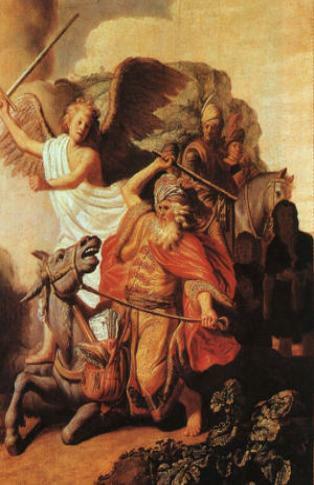 Then God opened the eyes of Balaam and he saw the angel standing there with the sword. So Balaam went with the princes to King Balak of Moab.